Whenever I am in Robinsons Place Manila, I have a hard time choosing where to eat. It's not that nothing is good, its just that I don't like paying for expensive food, which this place is full of. I don't want fast food for our visit so we scoured the mall from top to bottom, trying to find a well within my budget. Another parameter we introduced after the word budget, they should serve beer. The second requirement threw most of our choices out the window as most do not carry beer in their menu. 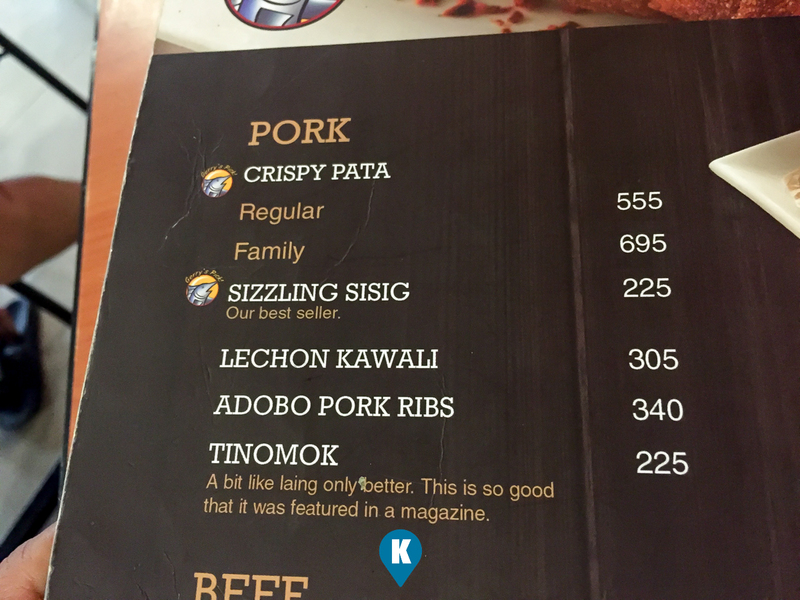 What's left in our resto choices? 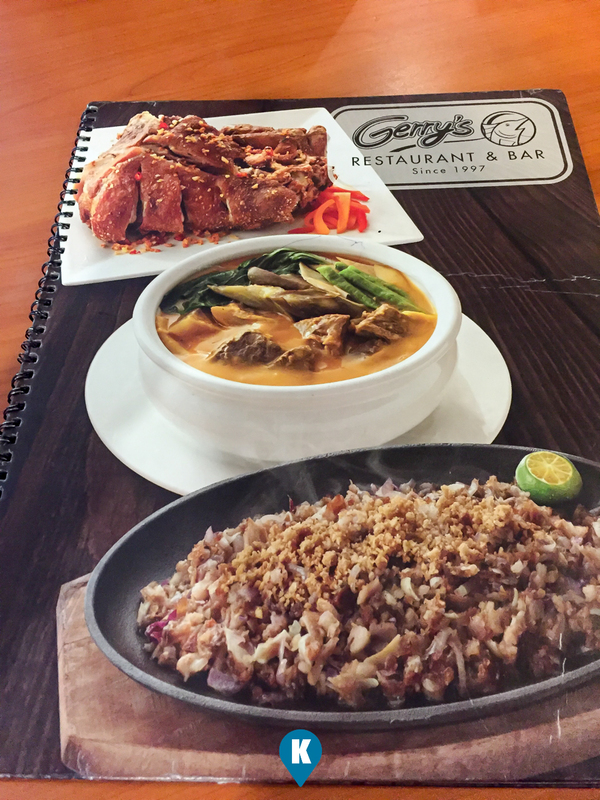 Gerry's Grill Restaurant and Bar on the top floor of the expanded new Robinsons Place Mall. The place is a bit small compared to some branches, with cramped tables and chairs, lots of diners (this is common with Gerry's Grill), one will have to queue with the head waiter or server in order to be seated. We were glad that this branch had a good queuing system. I almost had another fit when it was our turn, there was another diner, who did not queue, tried to get the vacant table meant for us (a bad habit we noticed is prevalent in malls). The head waiter or server politely mentioned to them that it was our table. My hidden angst subsided when the table was finally given us. After a bit of sitting, another server went to us and provided us with their menu. We are into efficiency, so when we were waiting for our turn, we already have our order pinned down. Crispy Pata, Rice, Kangkong and a Bucket of Beer. Service wise, the order taking was quick, made even quicker with us knowing what to order beforehand. This wasn't an advantage as we found out. Our order took some long time to be served much to our dismay. It was around 1pm when we there, so there was a number of diners still in the restaurant. Maybe their kitchen is small and that they have only a few staffs in the kitchen to served a full packed restaurant. Good thing our beer was delivered right away, so we had some swigs before the crispy pata came. May we also mention that the Kangkong was left out so we assumed this order was lost in translation or communication. Eventually it came, except for the time it took, we had no other complaints. Serving size is another thing that is of no surprise to us. 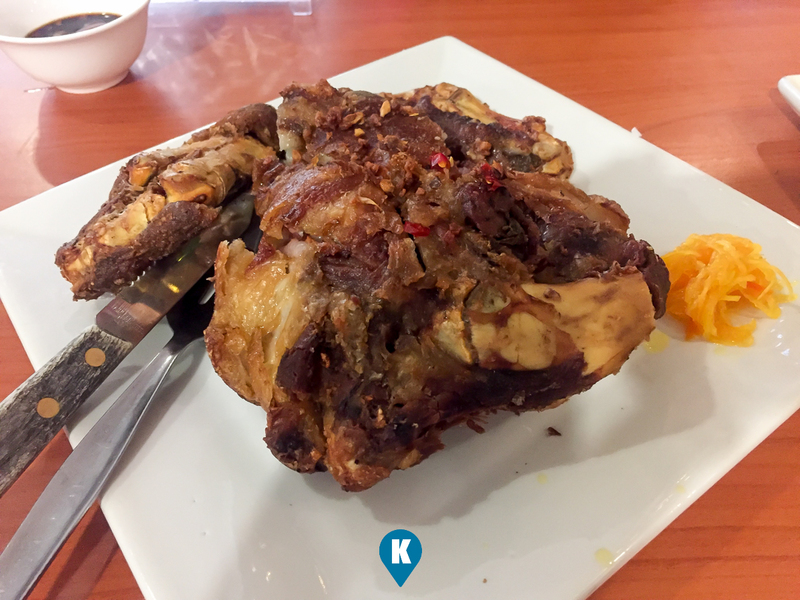 The rice was small, the crispy pata was average in size and the Kangkong was a small platter. The pata was good for 2 healthy living diners. I wasn't, so I think I alone can finish this whole pata. Good thing we had some kangkong so it filled me well. A good thing to have when you are also having beer during this meal. Tastewise, the crispy pata was crispy pata. The crust was crispy and tasty. It didn't had a burnt taste and I like that. The meat was juicy and tender, thank God. I didn't use the dipping sauce anymore as I like it the way it was served. Went well with steamed rice, I was smiling from ear to ear. It's not the beer talking, but it was my tongue and stomach. The kangkong was soft and tasty, with the right level of flavor, we had a great time with this dish. Both of the dishes went well not only with steamed rice, but with our beer as well. Great time indeed. Price wise, the cost for a small piece of crispy pata is decent for a mall based restaurant. I know where I can get better, but I had to travel a bit just to get it. 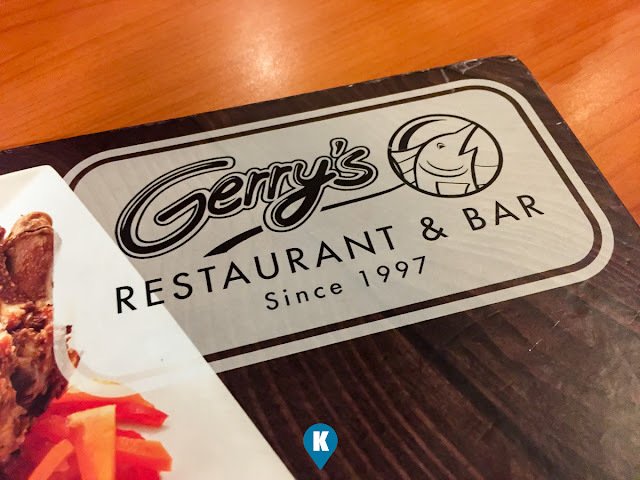 Here we have convenience with Gerry's Grill, located in a mall, tasty enough for us to wait diligently for it. It was worth the wait. Along with our other orders, costed us a bit more than a thousand pesos, but it was a nice meal altogether. No complaints here as to the food, service was fine, it was just the unfair diners who tried to steal our table that initially spoiled our experience. Good thing the food and the staff smiles overcame this and eventually saved our dining experience. Turning a bad start into a brilliant finish I give them 4 stars for this.